Auscorp IT offers printer repairs and servicing in the Perth Metro area. Repairs and maintenance are mostly done onsite at your business, or for more complex printer repairs, at our workshop in Malaga, Perth. We can provide you with a loan printer while yours is being repaired so that business can continue as usual. We use only manufacturer-approved replacement parts for all repairs. We recommend that you service your printer at least once a year. Auscorp IT will come out to your business and disassemble, clean and check your printer for optimal operation and efficiency. 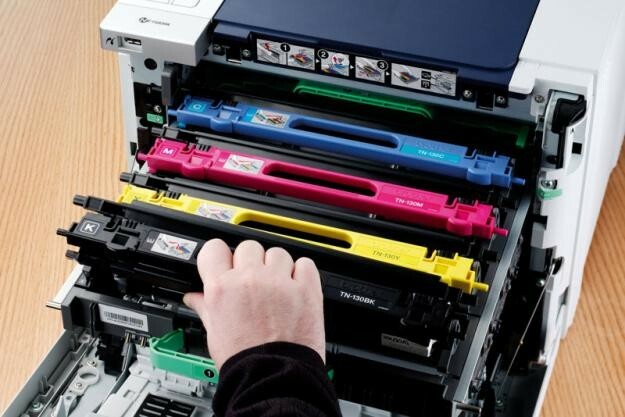 Servicing your printer reduces toner emissions and will extend the life of your cartridges and printer. Contact us to book a Printer Service and we can discuss further with you about a regular Service Plan. We can attend onsite, usually within 48 hours within the Perth Metro area, to look at your printer. We do non-warranty repairs on all major printer models, including Brother, Oki, Kyocera, Lexmark, Hewlett Packard (HP), Epson and Canon. We may be able to repair your printer under Insurance Claim if are authorised to do so by your Insurer. Please check with them or contact us. We can also provide you with a Replacement Quote for insurance purposes should you require this. Our insurance repair services are available to Individual/Personal Policy Holders and Business Policy Holders. We understand how important your business is, therefore we offer Loan Printers at no extra cost while your printer is being repaired by us. If your printer is not economically repairable, we will do a free onsite Printer Audit based on your current and future use and the best technology for your business plan. Our recommendations will be based on cost savings, increased productivity and environmental impact.